Hereditary Grand Duke Guillaume and Hereditary Grand Duchess Stéphanie are currently on an economic to the United States, with the current focus on Luxembourg's emerging space sector. 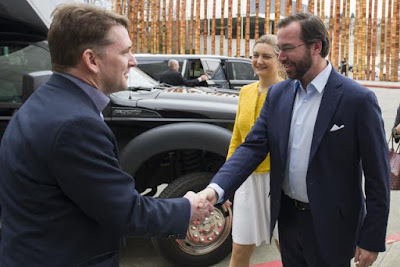 On the 10th, the Hereditary Grand Ducal couple were in the Seattle area to visit Vulcan Aerospace and Planetary Resources, the latter of which specializes in asteroid mining and participates in the Spaceresources.lu program. In November of 2016, Luxembourg became a shareholder in Planetary Resources with an investment of €25 million to support the company's 2020 goal of launching an asteroid mining system. Deputy Prime Minister Etienne Schneider is also accompanying the Hereditary Grand Ducal couple for the visit. The next stop will be Silicon Valley. More information from Paperjam and the Luxembourg Government website.